Well, it’s no secret…if you’ve been following me for any time at all, you probably know by now that I’m a wee bit obsessed with concrete. 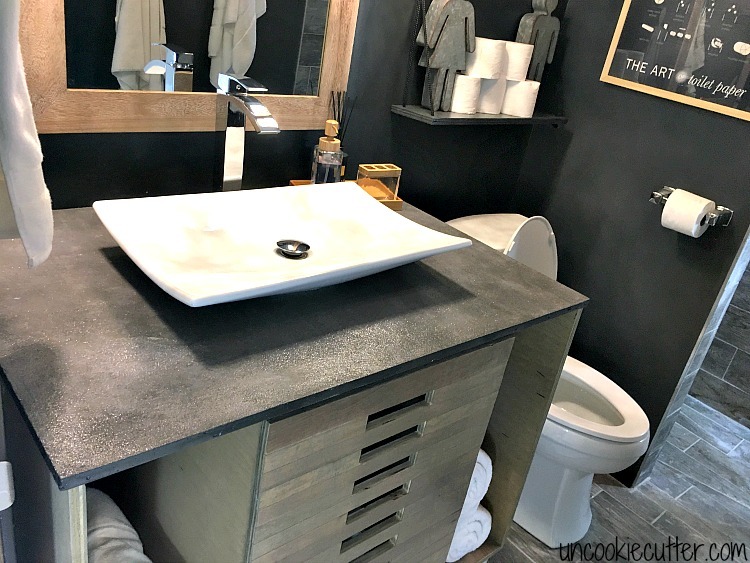 It’s so great and one of my favorite projects I’ve done with concrete is my vanity top back when I did redid our hall bath last fall. It was such an easy project and really gave us the feel we wanted in the new bathroom. Concrete is such a fun and affordable medium to work with. 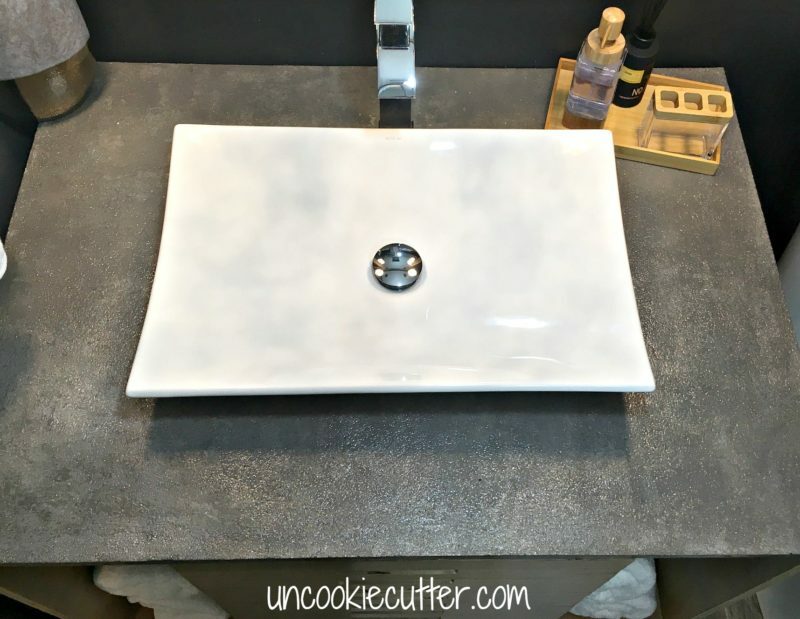 So, let’s talk about this concrete vanity top. This post contains affiliate links for your convenience. Please see my full disclosure policy HERE. This post was originally posted on Sawdust 2 Stitches. *this should be included with the sink and faucet you buy. Because of that, you should buy the sink and faucet first. I started by measuring how big I wanted the top to be and building a form. I use melamine lined plywood to build the form. It will peel off easily later when the concrete is dry. I cut the plywood to the size I wanted to top to be and then added sides to hold the concrete. I just screwed the sides on. This top is about 3/4 inch thick. You’ll want the sides to stick up as thick as you are going to want the vanity to be. Make sure not to glue or use any sort of permeant bond on the sides – we will be taking it off later. Now, here is where it gets a bit different from my other tables. We are going to need holes for the plumbing. 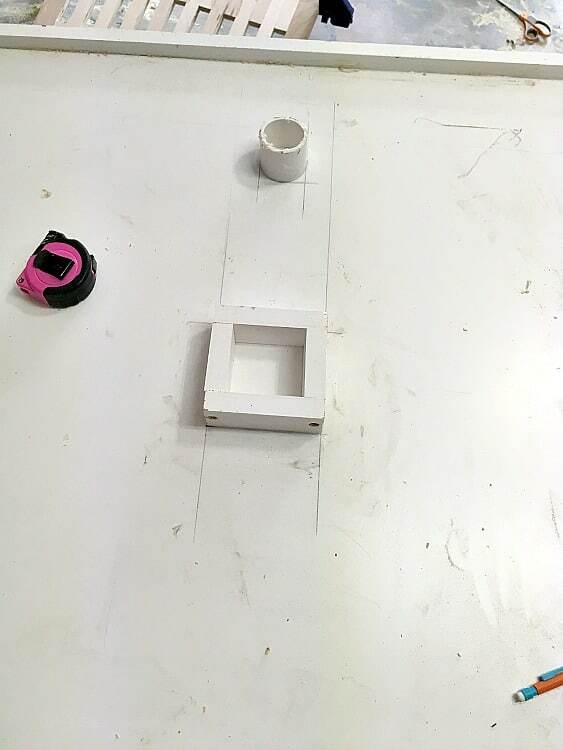 The sink that you are going to use should be bought first, and it should come with templates for the holes. 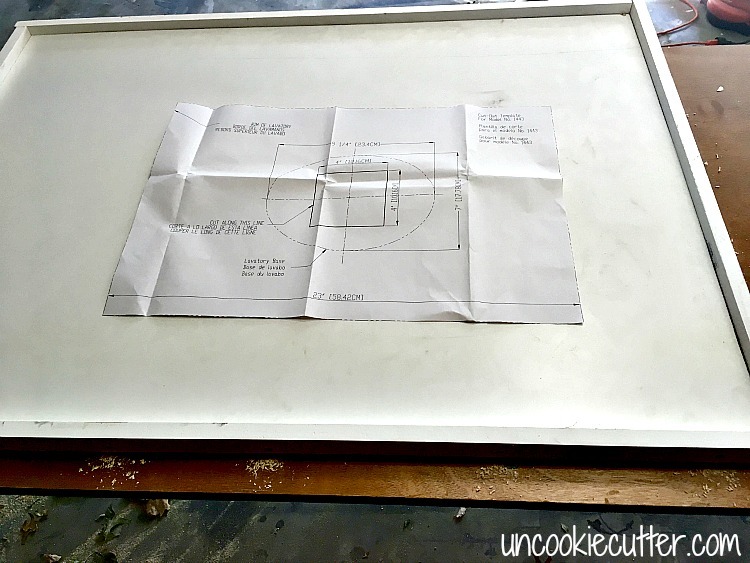 I decided on a pedestal style sink, so the cutouts won’t have to be as big as if I had bought a sink that was drop-in style, for those I would need a much bigger cutout. Either way, I built a little square out of scraps for underneath the sink. I found and marked the exact spot I wanted it to go. Sort of the same thing with the faucet. Whatever faucet you buy should have a template with it. Almost every faucet would have either one or three inputs for plumbing. The faucet I picked out had one, so I only needed one spot for a pipe. I used a piece of PVC piping and just used the template to find the size I needed. Make sure their is enough room for the pipe, but not to much that it’s going to peek out from under the faucet cover. 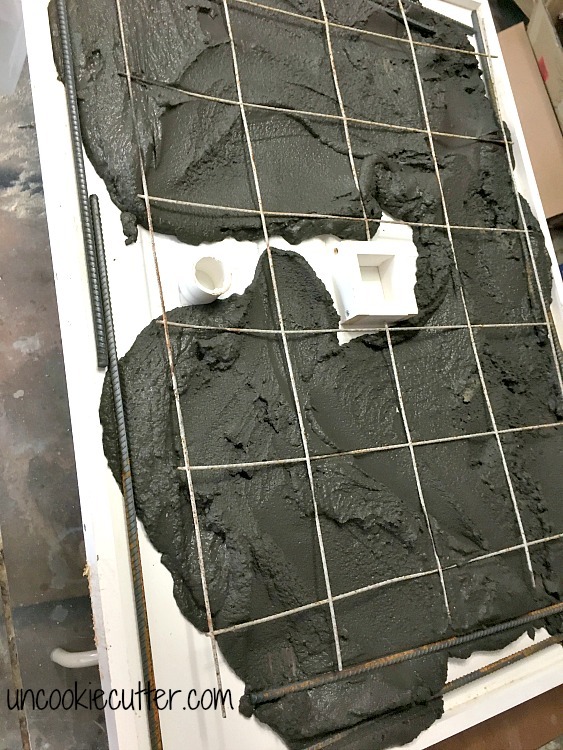 Now that you have the form all set up and the cutouts where you need them, you’ll want to use waterproof silicone to seal up all the cracks. 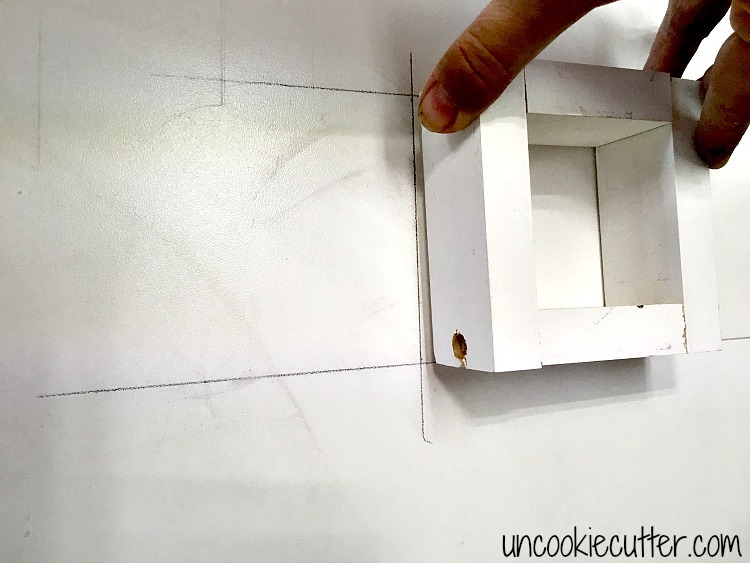 Make sure to hit around the the edges of the cutouts as well. Now, things are going to get messy. 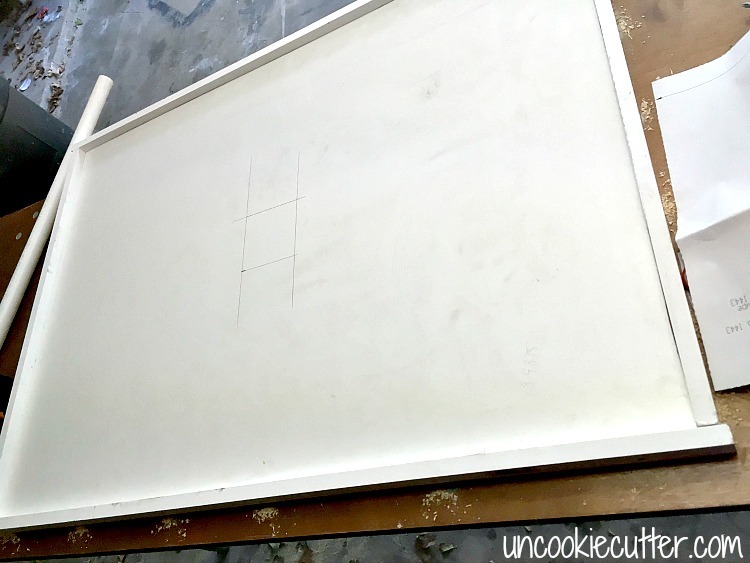 I covered my garage work table with heavy duty plastic and set the form on top. You will want to get underneath and all the way around later, so make sure it’s on some sort of surface that you can work around. So, when I made this I didn’t know Quikrete made a mix designed for concrete and countertops. 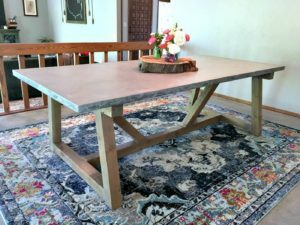 I used the concrete and countertop mix on my friends concrete dining table and it worked fabulous. 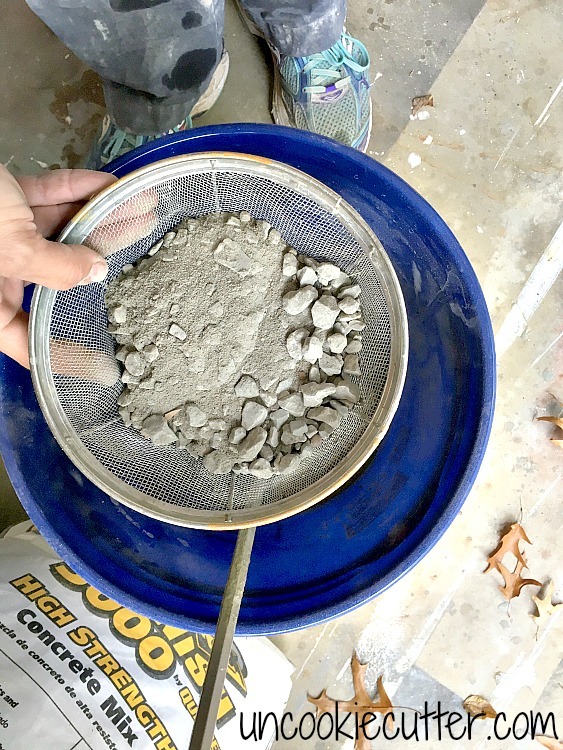 If you don’t have access to the concrete and countertop mix, or want to save a little money, use regular concrete and you can sift out the larger pieces of aggregate. 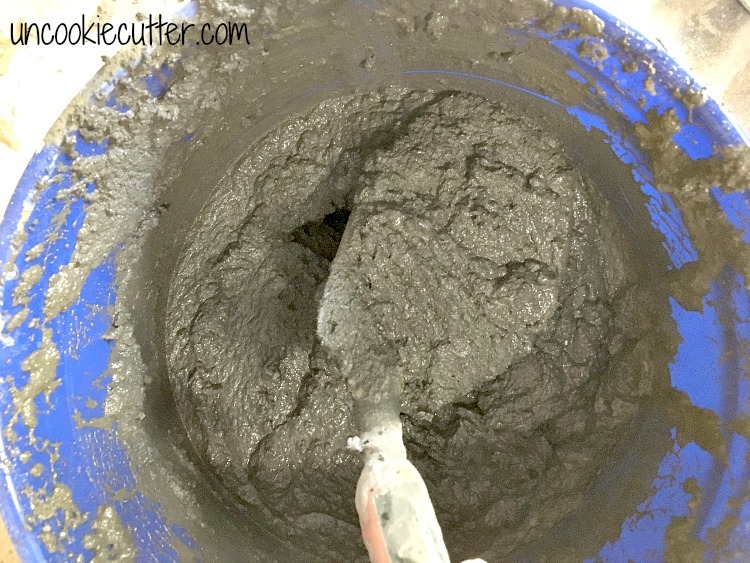 I added the sifted concrete to the already dyed water and used my drill with an attached paddle mixer to mix it all up. Follow the directions on the bag to get the amounts appropriate to mix in. Now it’s time to pour the concrete into the form. You’ll also need to add any rebar and wire mesh in now. Adding this extra strength it will help hold it up in case it ever wants to crack. Make sure the supports are not sticking up out of the concrete anywhere when you get it filled. After you get it filled up, take a 2×4 and, in a zig-zag pattern, smooth the top out by running the 2×4 across the top and smoothing it out. 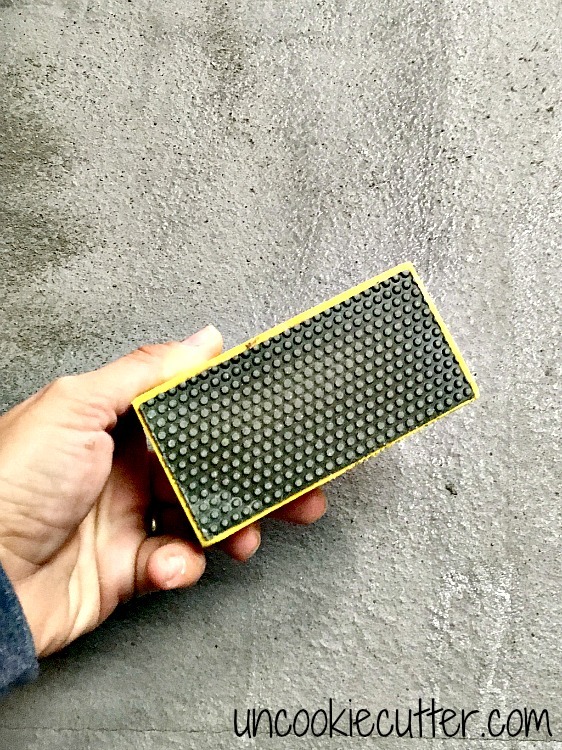 Next, take a hammer or something that vibrates (like a sander) and hit the sides and underneath for a while to get out any air bubbles and to settle the concrete down. Then take a trowel and get it as smooth as possible. Now, it needs a week or so to dry. It will lighten up a bit, but that’s okay. 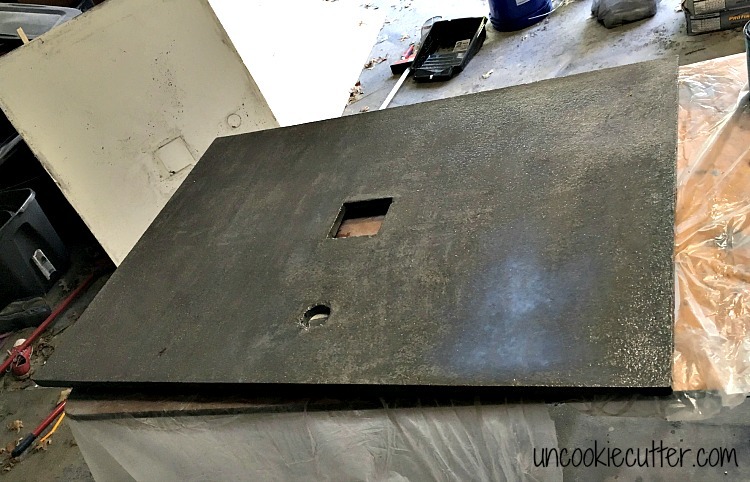 After it’s dry, take a concrete sanding block and sand it nice and smooth. Now it’s time to remove the form. Unscrew the sides and try to slowly pull it off. I used a flat surface trowel to get it to pop off and slowly work it away from the concrete being careful not to chip it. 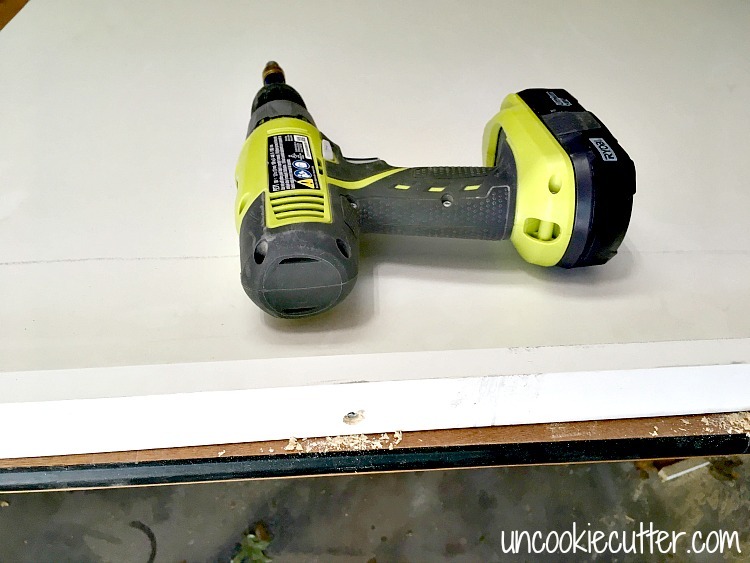 Once the form is off, use your sander again to work down and edges and get it how you want it. Make sure and clean up any dust and take your time to really make sure it’s clean. Then seal it with a concrete sealer and then use the Polycrylic to finish it off. I used about 3 coats of Polycrylic after the sealant. I brought it in and placed it on top of the vanity I built. 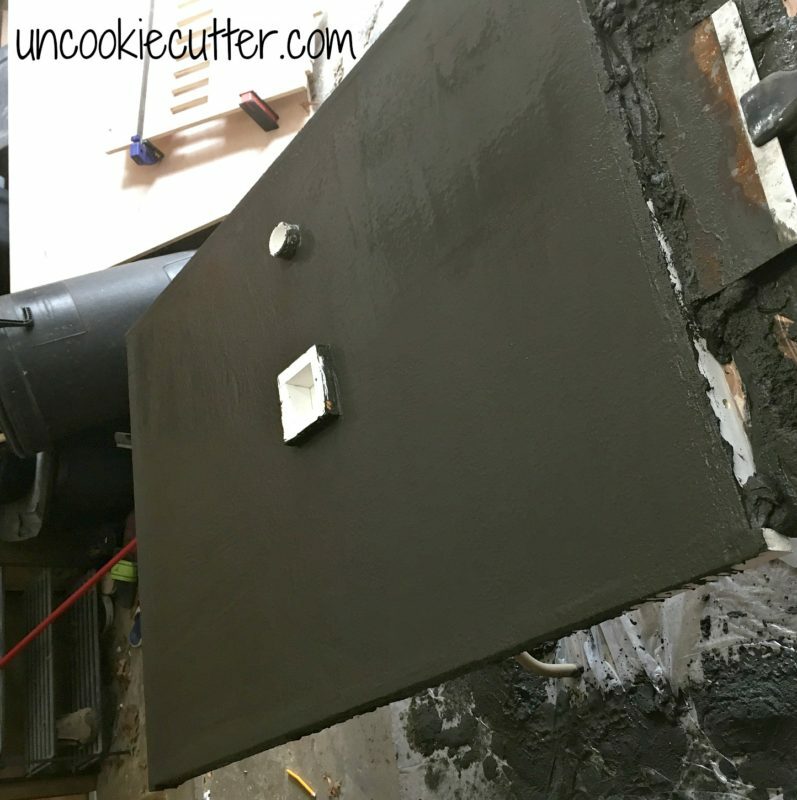 Then I placed the sink on top of the concrete and used plumbers putty to attach it to the slab. I attached the faucet from underneath and used silicone around the edge of the top of the faucet. 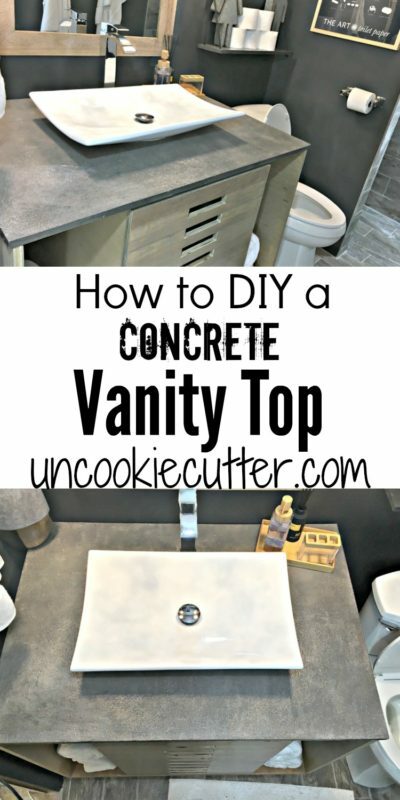 That’s about it for my concrete vanity! 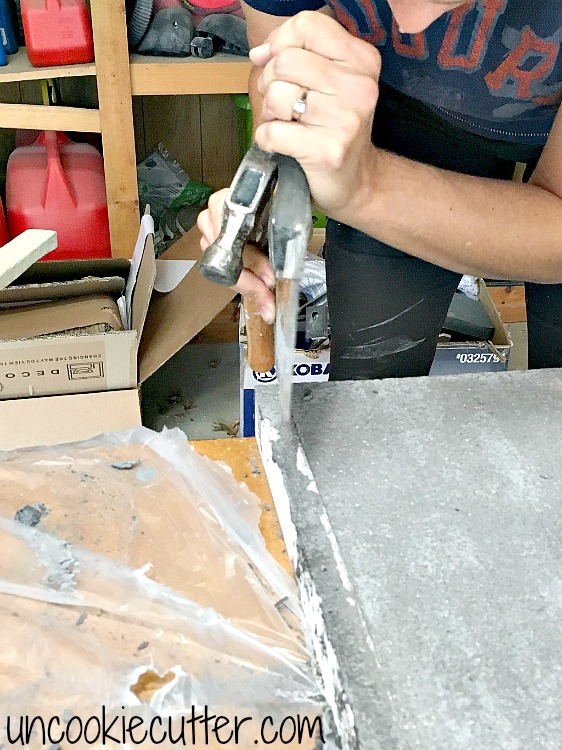 Head over to DIY Pete and read through his tips on pouring concrete. I watched him before I ever got started working with concrete and he is the master. 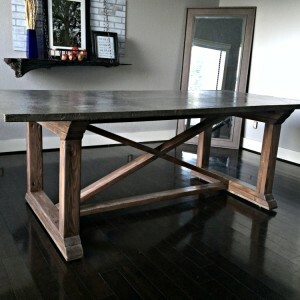 Check out my other concrete projects by clicking the links below. Sound off below and let me know if you have any questions about the vanity. Thanks for stopping by! This came out awesome, love it! 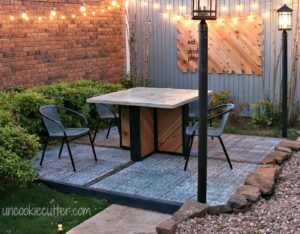 April, you are a concrete master!! This turned out amazing! Fantastic job. I love the finish. This looks amazing. I have to congratulate you for this DIY job. But your looks really stylish, well done !